Frustrated Institute manager Kevin Deery claims the Premier League play-off fiasco has ruined his club’s preparations for the 2017 season and believes the IFA would not have allowed it to happen had Linfield or Glentoran been involved. Deery was full of praise for his players who lost out on top flight football to an injury time winner in Wednesday’s second leg against Ballinamallard - SEVEN weeks after the first leg at the Riverside Stadium. “I think those in the hierarchy need to learn from this that they can’t take liberties with a club. If a Linfield, a Glentoran or a Cliftonville had been involved in this the situation would have been resolved a long, long time ago. Deery said lessons must be learned from a fiasco which has left the Drumahoe club struggling to catch up on rivals whose preparations are already well underway. “I think those in the hierarchy need to learn from this. 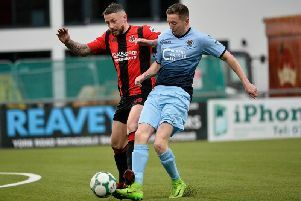 They can’t take liberties with a club,” explained the former Derry City midfielder, “If a Linfield, a Glentoran or a Cliftonville had been involved in this the situation would have been resolved a long, long time ago. “What has happened could effectively ruin our preparation for next season and, in some ways, it already has. There are teams already in pre-season with players signed and for us, being geographically out of the way a bit, it is a challenge to get players. Despite his disappointmnt, Derry had nothing but praise for his players after Wednesday’s 3-3 draw in Ferney Park. “The entire situation has been disastrous but for us then to put in the sort of performance we did, seven weeks after our season was over, says everything about these players.